Pacific Coast Jet, a San Francisco Bay Area-based jet charter company, announced that it has added a Phenom 100E to its fleet of luxury charter aircraft based at San Jose International Airport. The company has additional aircraft based at Oakland International Airport as well. 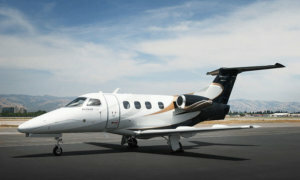 The Phenom 100E offers next-generation technology and leads the way in performance. It can take off from runways as short as 3,125 feet, can land in 2,722 feet, and is one of the fastest jets in its category. With state of the art avionics, enhanced situational awareness and a glass cockpit with large displays, it’s a favorite among pilots. In a partnership with BMW DesignworksUSA, the cabin offers superior luxury, beginning with the largest cabin in this class, providing more head and leg room. Featuring the largest windows in this class provides a bright and airy ambiance while the clean lines of its design maintains a modern serenity. Additionally, the largest baggage compartment in this class assures that passengers can accommodate all the gear necessary for their adventures. The rear lavatory provides a “unique in this class” rigid door separating the lavatory from the cabin as well as two windows creating a larger feel to the space. With the addition of the Phenom 100E, Pacific Coast Jet increases its fleet to twelve, which also includes the Phenom 300, Citation Mustang, Citation CJ1, Citation CJ2+ Citation CJ3, and Citation Sovereign, all based in Oakland or San Jose. From local flights around San Francisco, Oakland, Sacramento, Silicon Valley, Napa, and San Jose to Coast to Coast and any point in between, Pacific Coast Jet offers clients flexibility and luxury throughout the US. Pacific Coast Jet additionally has access to more than 5,000 aircraft worldwide with the ability to arrange planes and itineraries to meet any needs.